The legends of James, the brother of Jesus, tell how he traveled to Spain and preached the gospel after the death and resurrection of Christ. He returned to Jerusalem and was beheaded by Herod Agrippa in 44 AD, but his followers rescued his remains and an angel miraculously returned his body to Spain in a stone boat. The apostle and his two disciples were entombed near the northwest tip of Spain and forgotten until the 9th century when the tomb was discovered by a hermit, Pelayo, in a "field of stars," or campo stella. His bishop, Theodomir, built a church on the spot and news spread fast of this new shrine. The Church encouraged pilgrimages to Santiago (Saint James) in the 13th century because the Saracens had blocked the route to the Holy Land and the Papacy had relocated from Rome to Avingon, France. Christians and Moors were in a struggle for supremacy of the Iberian peninsula, and the influx of pilgrims helped to secure the northern part of Spain. Donations by wealthy pilgrims helped to build more elaborate churches along the way as well as refuges, hospitals, and hotels. West to Santiago de Campostela. 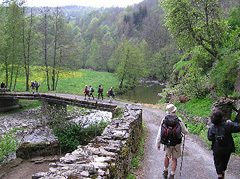 The Camino, or road, to Campostela was not one road but many that funneled into Santiago from all over Europe. [See a map of all the routes, here.] 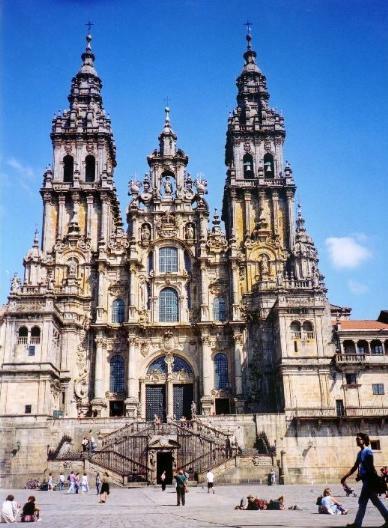 The most famous part of the Camino began at the Basilica of St. Mary Magdalene, in the center of France at Vézelay, then headed southwest through the Limosin and Aquitaine regions before crossing the Pyranees mountains into Spain at Pamplona. From there the Camino proceeds west across the high plains of Spain. others for the forgiveness of sins. Pilgrims, or perigrinos as they say in Spain, mostly traveled on foot, but some of the wealthier pilgrims preferred to go by horseback. The historical guidebooks say that the trip from southern France to Santiago de Campostela took 28 days by horseback, and more than 2 months on foot. 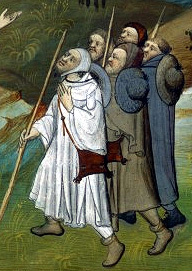 Modern pilgrims hop a flight out of town after their pilgrimage but for medieval travelers, that was only the halfway point of the journey. Though the way was long and difficult, it was made more pleasant by company. Pilgrims traveled together for safety and companionship. There were even many tour guides who would provide transport, lodging, meals, and excursions to local shrines along the way for a package price. 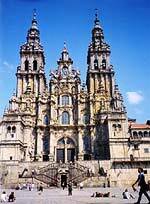 These tours were so popular that on any given day there could be as many as 80 pilgrim tour groups leaving Santiago. Though there are a few written accounts of pilgrimages made by women, they were rare. When a man began his trip he would make out a will, settle his debts, make peace with his enemies, ask forgiveness of those he had offended, and make confession to his priest. Then he would swear an oath that would bind him to complete the journey on pain of excommunication. A ceremony was held in his local church that was not unlike a knighting. In the ceremony the pilgrim was given a walking stick that was shod with iron to ward off evil and wolves, a broad-brimmed hat, a mantle, usually of blue or brown wool, and a leather bag called a "scrip." Those who returned successfully, and many did, were highly revered by their peers. The connections that they made and the stories that they told of the outside world helped to create a common culture throughout Europe. A journey from England to Santiago de Campostela could take a year or more to complete, even with a guide. The pilgrims carried very little with them other than money and a pilgrim's passport called a "credential" that attested to the pilgrim's character and the vow he had made. 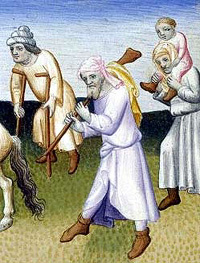 This entitled him to refuge in the monasteries and guesthouses set up along the way for pilgrims for little or no cost. They were also supported by charity from those that believed God would bless them for helping the pilgrims. There were monks who felt a calling to repair shoes or cut the hair and beards of the pilgrims for free. The pilgrims were protected by various orders of knights. But they couldn't protect them from everything. The pilgrims faced many dangers from injuries and illness to violence and death. They faced attacks from wild animals, especially wolves in the mountains. There were robbers who would wait by poisoned water wells for thirsty pilgrims to drink the water then they would strip their bodies after they died. There were private bridges with high tolls, and ferry boatmen often took advantage of the pilgrims, overloading the boats so that they would capsize and drown the hapless pilgrims. But, worst of all, were the imposters who would disguise themselves as fellow travelers, monks, or even knights and fall upon their companions on a desolate stretch of road. As the weary pilgrims approached Santiago de Campostela they would feel excitement welling up inside until one of them called out "mon joie!" upon spotting the towers of the Cathedral. The quiet of the country roads would give way to the cacophony of the city filled with pilgrims from many lands. Before the pilgrims were allowed to enter the Cathedral they had to be shaved and shorn, washed, and robed in new clothes. They burned their old clothes as a symbol of turning from sin. This helped to keep down the spread of diseases and boost the incomes of local clothing merchants. After the fresh, clean pilgrims entered the cathedral and confessed, they celebrated the mass, solemnly mounted the steps to the altar and embraced the effigy of St. James. The pilgrims were very quiet in the church as they witnessed on these moments with serious faces. Many had profound experiences of faith and wept openly. They were given a cockleshell (a scallop shell) as an emblem that they could sew on their clothing or hat. This badge was worn with pride by the pilgrims for the rest of their lives and many had a shell emblem carved on their tombs when they died. The European Union has restored the old pilgrim routes as cross-country hiking trails by clearing old paths, moving some away from busy motorways, posting easy to understand signs, and establishing rest stops for travelers. If you have pilgrim credentials, you can have them stamped along the way at police stations and churches. There are many guesthouses, hostels, and lodges that cater to pilgrims as well as banks, markets and restaurants along the way so it is not necessary to carry much with you. You can buy food along the way and wash your clothes at the pilgrim lodges. There are tours that will transport your luggage to your next destination each day so you can walk unencumbered, too. Most pilgrims only walk the last 100km and take a bus or auto tour for the rest of the trip. Some pick and choose which parts of the trail they want to hike. Some hikers come back year after year to complete different parts of the pilgrimage. If you would like to explore the idea of making your own pilgrimage, check out the websites below. Over 100,000 people applied for credentials this year (2006) and many more are expected next year. There is a huge community of hikers and pilgrims of all ages who have a special bond with each other through their shared experience. And not all of them are Catholic—many pagan pilgrims make the tour because the churches are built on ancient sacred sites that pre-date Christianity. No matter what your reason for making a pilgrimage, they say, it changes you. Are you ready? American Pilgrims on the Camino this is where you can get pilgrim credentials. World Walks The Pilgrimage Route of St. James 2006- for organized tours. If you want to add this article to your list of favorites or email it to a friend, please use this permanent URL, https://stores.renstore.com/-strse-template/0608B/Page.bok. Permission is granted by the author to quote from this page or use it in handouts as long as you include a link back to Renstore.com.